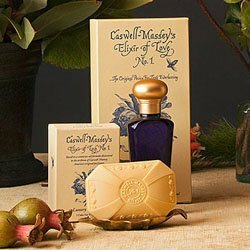 Caswell-Massey Elixir of Love Perfumed Bath Soap and Cologne | P.C. Fallon Co.
Elixir of Love No. 1 is a captivating, luxurious, yet subtle fragrance that is a favorite fragrance of many loyal Caswell-Massey customers. Elixir of Love's secret formula draws you in to its powerful embrace. The scents and extracts of jasmine, lavender, Egyptian musk, and passionflower create this perfumed potion that is completely pleasing to your senses. Currently available items are usually In Stock. Allow Elixir of Love No.1 to enhance your daily bath experience with perfumed luxury Bath Soap or Bath & Shower Gel. Follow with a spritz of the irresistible Elixir of Love cologne spray for an unforgettable signature scent. Elixir of Love is based on a formula from Victorian times, and remains completely captivating today.